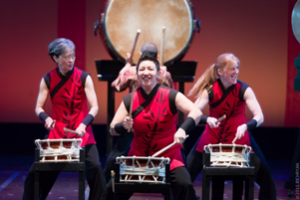 MINNEAPOLIS (Feb. 28, 2018) — Powerful women take centerstage at the upcoming Taiko Tuesday concert that is followed by a Women in Taiko panel discussion. Ensō Daiko will perform with special guest, Tiffany Tamaribuchi from Sacramento, Calif., followed by the “Women in Taiko” panel discussion as part of the the next Taiko Tuesday event at 7 p.m., March 6, at the O’Shaughnessy Auditorium on the campus of St. Catherine University, 2004 Randolph Ave, St Paul, MN 55105. Presented by TakioArts Midwest, Taiko Tuesday concerts promise loud, energetic performances that combine music, dance, culture, and pure athleticism. 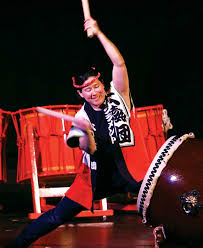 Tiffany Tamaribuchi, co-founder and director of the professional women’s taiko ensemble, Sacramento Taiko Dan and Jodaiko, has played and toured with a number of notable groups from Japan, including Za Ondekoza, Zampa Ufujishi Taiko, Eisadantai Mafuekaji, and Shidara. She was the winner of the 2002 All Japan Odaiko competition and finalist at the first Tokyo International Odaiko Contest. Always working to deepen understanding about taiko in Japan for North American audiences, Tamaribuchi recently debuted the first Ondeko group outside Japan after training with Kasuga Onigumi on Sado Island and receiving their permission to share their indigenous art form with others. Ensō Daiko performs traditional and contemporary taiko repertoire, with an emphasis on original compositions. For over 20 years they have contributed to the expanding canon and innovation of North American taiko, and have taught thousands of students of all ages and abilities. Ensō Daiko was founded as Mu Daiko in 1997 by Rick Shiomi. It was renamed Ensō Daiko in 2017 by current Artistic Director Jennifer Weir, when TaikoArts Midwest took over the taiko program formerly supported by Theater Mu. TaikoArts Midwest’s mission is to nurture artistic excellence and deepen and expand the impact of taiko in our community. Inspired by both tradition and innovation, they produce concerts, offer studio classes, lead school residencies, and perform for community and private events. They are the springboard for two resident taiko groups: Ensō Daiko and ensemble-MA. Recently founded as an independent spin-off from Theater Mu, TaikoArts Midwest is Minnesota’s leading taiko organization.